Well greetings friends. 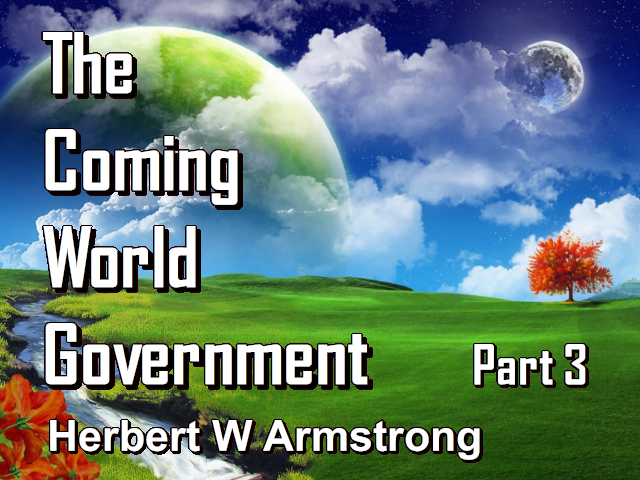 This is Herbert W Armstrong with the Good News of the World Tomorrow! And once again I do mean good news because we are going to have Utopia, believe it or not. We're going to have a millennium. We're going to have world peace. But a great many hard-headed practical scientists today who know what is being developed, and know the trend of modern science and technology and invention, are telling us that only one thing can bring world peace, and that is world government. Now as I was saying in the preceding program it's impossible for men to bring it about. Jesus Christ said that we would bring ourselves to such a place that if God did not step in and intervene; unless there is a supernatural God, a supernatural power who is looking down on this world, and who is about to intervene and save us from ourselves, then I say to you, my friends, human life would be blasted off of this planet. Now that's precisely what Jesus Christ said, but He said that for the elect's sake God is going to intervene and save us from committing mass suicide of the entire human race. But on the other hand, Jesus Christ came with a Gospel and that Gospel was the good news of the world tomorrow. It was good news, it was not of this world, it was of the end of this world. Now that didn't mean the earth's going to blow up. You know, there's a great difference between the word 'world' and the word 'earth'. The world is the pattern or the design, the system of society that has been built on this earth. He said to the man you have to choose. He made man a free moral agent, an independent entity, with the possibility of either choosing to go the way of God and to accept God's rule and submit, and surrender to God's rule and receive the blessings thereof. Or to reject the rule of God and to turn away from God and to defy God. And to go his own way and set up his own ways on the earth and reap the curses of that way. And find that it's going to wind up in death ultimately. Now He taught the good news of the end of this world, and believe it or not, that sounds crazy doesn't it? The good news of the end of the world. Well it's the best news that you could hear, because it does not mean the end of the earth. It does not mean the end of human existence, it doesn't mean anything of the sort. It means the end of this present kind of pattern that's been built since Adam, of men rejecting God's Way, rejecting the government and all of the wisdom, the help, the assistance of God, that they could receive. Rejecting every good thing that God has just desired to bestow upon humanity. And the system of society that man has built contrary to the ways of God, and in defiance of the ways of God, and without the divine power, and the divine help that man has so sorely needed. Listen my friends; do you know that Adam wasn't ever made complete? Let me put it this way about you, yourself. Let me just say to this and I want you to understand me and I mean this literally — a lot more literally than you're going to think I mean it. You're not all there. That is, most of you are not. Now the way I mean that is this: God did not make man, as He created Adam, complete. He was made of the dust of the ground, but he needed spirit that was not put there. God had in the Garden of Eden, accessible to the man, the Tree of Life which was the symbol of the Holy Spirit of God. Man was made incomplete; man was made to need the Spirit of God, and it was available to the first man Adam and to his wife Eve, but they rejected that. Because in order to have the Holy Spirit of God, which is the life of God, and the help of God, the energizing power of God, eternal life, the gift of God, the wisdom of God, and yes, the character of God, as well as the power of God that comes with the Holy Spirit, which is the power with which God created the universe. And that power could come into man, it could've come into Adam and Eve. But in order to have that power, that great love of God in their hearts by the Holy Spirit; in order to have all of the character, and all of the life, and the essence and everything that would have come by the great power of the Spirit of God; they would have had to have yielded themselves completely to God. Because God's Spirit emanates from Him, it would mean they would have had to have walked with God as Enoch, one of the men of ancient time did. And two can't walk together, according to God's word, except they be agreed (Amos 3:3). Now God isn't going to change His ways to your way of thinking. And so Adam rejected it and Adam never received the Holy Spirit. And in the third chapter, and in the end of the third chapter of Genesis, the first book in your Bible, you will find that God drove Adam and Eve out of the Garden of Eden so they couldn't get back to taste or to touch the Tree of Life and take of the Spirit of God. And He put angels with flaming swords pointing in every direction to keep the way of the Tree of Life and to prevent them from going back lest they take of the Tree of Life and eat and live forever. So they could not have eternal life, so they could not have the Spirit of God, so they could not have those things. Well now, they were made to need the Spirit of God, and you were born, my friends, incomplete. You were born physical, but you were born to need the Spirit of God. And the Spirit of God cannot, and will not come into any man except that man surrender to God. Until we have had the self crushed. And this self that is defiant toward God, because the carnal mind just can't comprehend or understand the things of God: "...the carnal mind...is not subject to the law of God, neither indeed can be." (Romans 8:7) As you read in Romans the eighth chapter. Now a normal, natural carnal mind may be a brilliant mind. It might have an IQ of 130 or a 145, or perhaps it might be one of these super brilliant minds — I was going to say, minds so super brilliant it's about to crack up — and that might be true at 165 IQ. Well that's going clear beyond most of us; frankly I wouldn't want such an IQ as that, because it would be pretty hard for a man to keep his balance if he was that brilliant. But, nevertheless, there are some very brilliant minds that are normal natural minds, and still, the normal natural mind is not subject to the law of God. Well, there we are my friends and Jesus came to make it possible for us to receive the Spirit of God. And He came to conquer Satan. He came to call His disciples and to train them and teach them that they might become apostles with authority to go out and represent Him and proclaim the Good News of the coming World Tomorrow. Now today's world, my friends, is not good. Oh, there's a lot of good in it; because what is it — it's a mixture of good and bad. It's a mixture of truth and error. It's a mixture of good and evil. That's what it is, that's what is in human nature. That's the tree Adam and Eve took of, the tree of the knowledge of good and evil. A mixture of evil with good, it's a bad mixture. Now what we need is to get rid of all the evil and retain the good, but receive the rest of the good we need from God which is empowered by His Holy Spirit. Now, Jesus Christ is coming again to this earth and when He comes again He is going to set up a world rule. Today's world is going to be all over. God has allotted six thousand years to allow this present way to run its course. To allow man to defy Him. God determined, and God ruled and decreed, that man must choose whether he will accept the rule of God or take his own ideas and set up his own rule. And that is what man has done. So this civilization, this society, isn't God's way, my friends, it's man's way in defiance of God and it isn't good. You know the wretchedness that is in this world today, and people say, "Why does God allow wars? Why does God allow this human suffering?" Why don't you ask: why does God allow man freedom to do what he pleases? Because it's what man pleases that's bringing all this upon us. Why can't we see that? No, we want to do our way, and we want God to change the laws around so that our wrong way will bring a right result. And God is not going to compromise, my friends, He is not going to compromise with you. You'll have to put down your stubborn rebellion, and a lot of you are in a stubborn rebellion. And I'm also very glad that a lot of you listening to me have already put that down, and perhaps are filled with the Spirit of God. I wish that you all were, but I just know it can't be true. But you all can be and that's the good news. Well, when Jesus Christ comes — let's get onto that now. He's going to set up a world government. Now as I was explaining in the preceding program God did set up a government or a Kingdom of His own once before on this earth. But that was only a human kingdom, one of the governments of this world and it went the way of this world, although they had agreed to go the way of God. Now as I was mentioning in a preceding broadcast the United States government has a constitution — that's the basis and the foundation of the government. I mentioned that the League of Nations had a covenant, the Covenant of the League of Nations; because it was a league made up of a number of different nations. And there had to be an agreement between them as a foundation or basis, that would take the place of — say, the Constitution of the United States. So a covenant then is an agreement by, and between two or more parties. Now when God did set up a rule, a government of His people; which they had no opportunity to receive the Spirit of God, they had no salvation, therefore they were carnal-minded people, and had no chance to be anything else but carnal-minded people. They, in other words, were not all there. Now just to carry out the thinking what I started with here in this present program. They were not complete, they did not have the Spirit of God, and God didn't offer them His Spirit, and God knew that. But still He gave them His ways, which they could have observed and kept according to the letter of the law. And they promised goodly to do it, and so in setting up that nation there had to be an agreement, because they did need the help of God. And God at least was going to give them help in a national manner though they couldn't have the Spirit of God individually. But God would have given them supernatural divine aid, and counsel, and wisdom, and direction, and His power to help them. Now, ancient Israel needed God's help, and so the basis or the agreement was a covenant that God made. Now that was a contract and it was a marriage contract, and it put Israel in the category of being His wife. And it was the One who became the Lord Jesus Christ incidentally. Now, that nation didn't keep it, and the nation was divided into two different nations, and then each division was carried into captivity — first Israel and then Judah. And that means it's been comparing here in the preceding verses, with the Levitical Priesthood, of the ministry of the Levites under the Law of Moses. A more excellent ministry, than that Old Testament ministry of Levitical Priesthood. Something was wrong with that first covenant that God made with ancient Israel. That made them a nation, and it also made them a church, because Church and State were combined. That was God's way incidentally; we don't believe that today do we? Well in our type of system and government I wouldn't want to see the church and state unified under any circumstances. I'm mighty glad that we have separation of church and state, and that we have freedom in the United States. Because we are not organized, believe it or not, on God's pattern, and since we're not, we'd better have what we call democracy. Actually it isn't pure democracy, it's a republican form of government; but regardless of that I would much rather have this kind than any other kind I know of. If we don't have God's kind with the Almighty God ruling us. "For if that first covenant had been faultless [if it was a perfect covenant], then should no place have been sought for the second." (Hebrews 8:7). Notice they're not Gentiles any longer. They were Gentiles in time past, they'd been born Gentiles. Now if you've really been converted, my friends, it doesn't make any difference whether you were born a Gentile or what, you're not a Gentile, religiously speaking, any longer. If you're a Christian, if you've been converted. Now notice, a Gentile, while they were Gentiles they were without Christ, and if you're a Gentile you're without Christ. You have no Saviour if you're a Gentile. And you've got to cease to be a Gentile, and you have to become a naturalized citizen of Israel, and become an Israelite before you can have Christ as your Saviour. I tell you my friends, it's time we blow the dust off our Bibles and read what's in them. Do you think you're an alien from Israel, and you don't want to be Israel? You sneer at everything that way, and sneer at it, and say it's Jewish? Why do you hate the Jewish people so much? It's about time we quit hating them. Because if you hate them, and if you curse them, God will put you under a curse because He says so. Do you notice that? Now there've been a lot of misconceptions about it. Now let's get back to this again; what is a covenant? Now in Hebrews 9:15 and 18, I read that for you in the preceding program, it is called there a testament. And that is the primary definition of this 'diatheke', whatever this Greek word is, translated interchangeably however, so the New Covenant is a New Testament. It is then, Christ's last will and testament. Christ is the heir of all things. He wills to us His great inheritance, we are to share it with Him and to be co-heirs with Him. And what has God promised Him? Through Abraham Christ is the heir. Christ is the Seed to whom the promises were made, and the promises made from Abraham. It was not heaven, heaven is God's, it belongs to the Father. But what He made to Abraham, the promise for his seed, Christ, was this earth for an everlasting possession. He promised Him the earth for an everlasting possession. The promise made to Abraham was this earth, for an everlasting possession. And so we become co-heirs with Christ; we share His inheritance with Him; and to inherit eternal life with Him. First — an agreement between persons or parties. It's an agreement. Second — a solemn compact between members of a Church to maintain its faith, discipline, etc. It's a compact or agreement between parties. The covenant of the League of Nations, is the fourth definition, being the first part containing twenty-six articles of the Treaty of Versailles of 1919. Legal definition: an undertaking or promise of legal validity — and the synonym see 'contract'. Contract is the synonym, so it is a contract and the original covenant was a marriage contract, and so will the next one be. And you read about the marriage supper of the Lamb and how Christ is to be married to His bride, the Church, or His wife. Now is there any contradiction here, because covenant is not a testament, and yet it is sometimes called one, and some the other? No there is no contradiction because the New Covenant is both. What it is, is the last will and testament of Jesus Christ, but it is a conditional covenant and the conditions are given in your Bible. And we'll come to that in the next program. But you have to repent and return to God and begin to keep His commandments and have faith toward Jesus Christ accepting Him as your personal Saviour. Listen my friends; now don't forget to write in for this booklet — 'The United States in Prophecy' so that you can understand a whole third of your Bible that tells about world conditions and about our United States. Write in for our booklet 'The United States in Prophecy', that'll tell you where we're mentioned, it's the key that'll open up that third of your Bible. So, until tomorrow, goodbye friends.